The more unstable 'Fat Betty' became in Season 5, the more audiences loved to hate her. The hit AMC drama Mad Men returned for a sixth season on Sunday night, and fans flocked to viewing parties all over the country to celebrate the occasion. In Chicago, venues like the Public Hotel and Logan Theatre opened their doors for late-night soirees, serving retro cocktails on the rocks and welcoming Mad Men enthusiasts in their finest sixties attire. After four consecutive Emmy wins for Best Drama and a popular Banana Republic clothing line, the show has a rightful position in our cultural zeitgest alongside other fan-favorites like Breaking Bad, Downton Abbey and Game of Thrones. The episodes are very well written, beautifully filmed and certainly indicative of the times. Still, I find myself wondering: why do members of my generation in particular (those gosh darn millenials) romanticize a philandering cad like Don Draper and gloss over the unfair treatment of almost everyone else on the show who isn&apos;t a straight white male? Mad fans tend to put Don on a pedestal as the ultimate man-ly man: the square-jawed anti-hero who makes women swoon against their better judgment and prompts modern-day guys to take notes. The alpha-male chauvinsim of Sterling Cooper Draper Pryce feeds on a sexist environment that could never exist today; and yet, my Mad Men-obsessed friends (and many online commentators) enjoy the "harmless" voyeuristic experience of watching these white male ad execs get away with everything they can&apos;t do in real life. 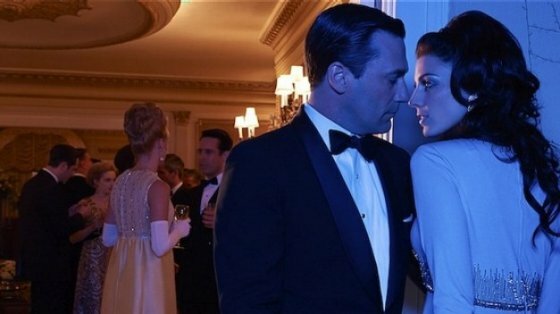 Mad Men devotees gravitate towards Don and repel his ex-wife Betty, even though their vices (rampant alcoholism and extramarital affairs for him, awful parenting and mental instability for her) shouldn&apos;t make any one the "villain" over the other. Jon Hamm&apos;s inherent likability as an actor versus January Jones&apos; regrettable stiffness probably doesn&apos;t help matters; but from a logical standpoint, shouldn&apos;t viewers have a little more contempt for the cheating husband and a little more compassion for the wife he discarded? The fact that most people I know (male and female) have zero sympathy for Betty, yet easily forgive Don for all of his flaws, is more than a little disconcerting. "I miss the old Don," was a common thread on Mad Men forums last year, with commenters agreeing that "Don is a liar and cheat...and we like him that way!" and cheering when he strayed from second wife Megan at the end of Season 5. Again, what is it about womanizing Don that keeps viewers coming back for more? Is he living some kind of fantasy that other men only wish they could pursue? Everyone loves a good anti-hero (take Walter White of Breaking Bad, for example) but sometimes I wonder why audiences like "unlikeable" characters so much in the first place. Peggy Olson, my favorite character, is the token feminist on the show. She fights to be taken seriously as an equal; and at the top of Season 6, she is well on her way. Still, I would never want to be in her position (a woman working twice as hard to land a man&apos;s job) and I don&apos;t understand why women of my generation would ever dream of living in an era that was so blatantly sexist. The 1960s are often viewed through rose-colored glasses; when in actuality, these years were some of the most tumultous and trying times in our nation&apos;s history. Meanwhile, audiences adore Joan Holloway as the sassy and curvaceous "Marilyn" of Mad Men, wishing more bold women with "real bodies" like hers existed in the new millenium. And yet, from my perspective, Joan&apos;s story is a sad one. She sleeps her way to the top; not because she is untalented, but because she doesn&apos;t even realize that her talent in the office should be enough. Alas, this is all she knows, and her overwhelmingly misogynistic society doesn&apos;t present her with many options otherwise. Another distressing aspect of Mad Men is the lack of diversity on the show in general. Season 1 introduced the closeted art director Sal Romano; but for some reason, his storyline was cut after Season 3 and audiences never saw him again. A lesbian subtext also briefly arose in Season 1 with Joan&apos;s female roommate; but after Joan politely brushed her aside, she too disappeared. Personally, I&apos;d welcome a return from Sal, or a more in-depth storyline for Zosia Mamet&apos;s character Joyce Ramsay: a lesbian friend of Peggy&apos;s whose confidence I found refreshing. And while Season 6 is guaranteed to show the Civil Rights Movement in full force, past seasons of Mad Men have featured minorities only in subservient positions (like the Drapers&apos; Puerto Rican maid, Celia) and seen only through the prism of white eyes. The first prominently-featured black character in a non-housekeeper role (Dawn Chambers, Don&apos;s new secretary and Sterling Cooper&apos;s first black employee) wasn&apos;t introduced until Season 5; and unfortunately, given very little to do beyond serving a cultural plot point. I understand that Mad Men is a show about upper-class white America in the 1960s, just like how Girls is a reprsentation of privileged white girls in modern-day Brooklyn. Still, I&apos;d like to see Mad Men creator Matthew Weiner fulfill his promise of giving black voices a real chance to be heard in future episodes. Hopefully, Season 6 will bring more empowered women, queer advocates and trailblazing people of color to the forefront of Mad Men than ever before. If the men of my generation can aspire to be more than Don Draper, and the woman can realize that they deserve better, then I&apos;ll raise my Old Fashioned to that. Leah Pickett writes about popular culture for WBEZ. Follow her on Twitter @leahkpickett or join the &apos;Mad Men&apos; conversation on Facebook.